The words of the 1940 hit by Oscar Hammerstein, composed by Jerome Kern, still ring true today. The cafés of Paris are central to what makes the city so special and dear to the hearts of millions, what causes people to miss Paris when they're not there, and makes them want to stay there longer when they are. It’s not one café or a few cafés. As the song says, it’s every street café. There are cafés everywhere. They seem to conspire together to create an atmosphere not to be found anywhere else. You walk into a café in Paris and sit down and become part of a way of life. There is a feeling of quiet conviviality and enjoyment that comes from being around and about in a wonderful city, sharing an environment with likeminded people – being part of Parisian life. If you have been to Paris or if you live there, you will have experienced this. If you haven’t yet, it is definitely something to look forward to. There are very old cafés, there are pretty and cute ones with beautiful exteriors, there are famous ones which everyone has heard of and has to go to when they visit Paris. But personally, when we are walking in any part of Paris and are ready for a coffee break and a chance to set down our pounds of camera gear, we just find the nearest café, get a seat outside if the weather is suitable or the café's outside heaters are on, and order coffee. And we have hardly begun to scratch the surface of cafés to stop at. It's worth noting that our favorites are the classic Paris cafés, not necessarily the latest and most trendy. Because we are photographers, we do tend to concentrate on the aesthetics of the café just as much as or more than on the quality of the coffee and croissants or the meals, the politeness and attentiveness of the waiters and waitresses and so on. This post is not really about the details or comparisons. 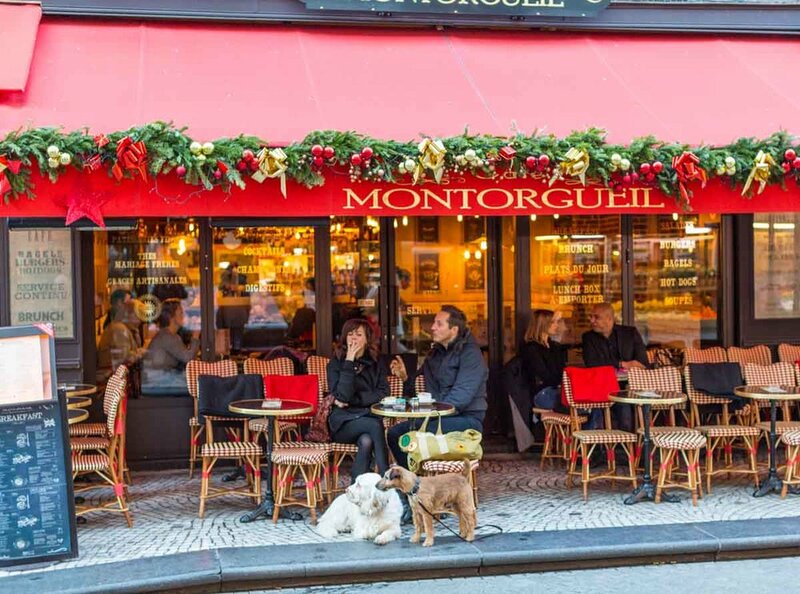 It’s about the café culture and the sheer enjoyment of being able to walk out in the streets of Paris, stop at a café and be part of this extraordinary city. We do hope this comes across in the photos. The Maison Rose in Montmartre on the left and La Penderie in the 2nd near Les Halles on the right. Above is the Bistro Saint-Dominique on the street of the same name in the 7th. 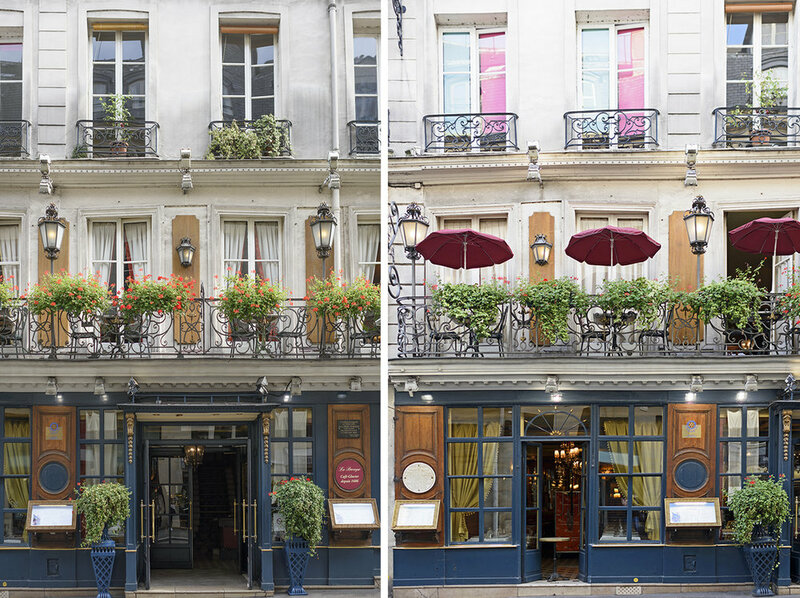 Two views of Le Procope in Saint-Germain, the oldest Paris café still in operation today..
Two very famous cafés are almost next to each other in Saint Germain: Les Deux Magots and Café de Flore. Ernest Hemingway talks about meeting James Joyce on the Boulevard Saint-Germain and going with him to the Deux-Magots for a drink. Café life is central to Hemingway's autobiographical A Moveable Feast which paints a fascinating picture of Paris in his day (the 1920s). Sartre talks about the Café de Flore where he often spent many hours writing over a single cup of coffee. Beauvoir, Camus, Picasso... the list of famous patrons of just these two cafés is long. But there are hundreds of cafés in the city with equally fascinating histories. Breakfast for two at the Café de Flore, sitting outside on a spring day. So which cafés should you visit? People often write to us on Instagram or through Parisian Moments and ask, “We're going to be in Paris in March (or April or June or September) – can you recommend any great cafés we should go to?” And we always answer, mentioning the famous ones such as Les Deux Magots and Café de Flore, the majestic and magnificent ones such as Café de la Paix, Le Train Bleu – more upscale restaurants than the usual idea of a café – some of our favorites such as the Saint-Régis on Île Saint-Louis or the Café Rouissillon on rue de Grenelle, the Malabar on rue Saint-Dominique, the Eclair on rue Cler. 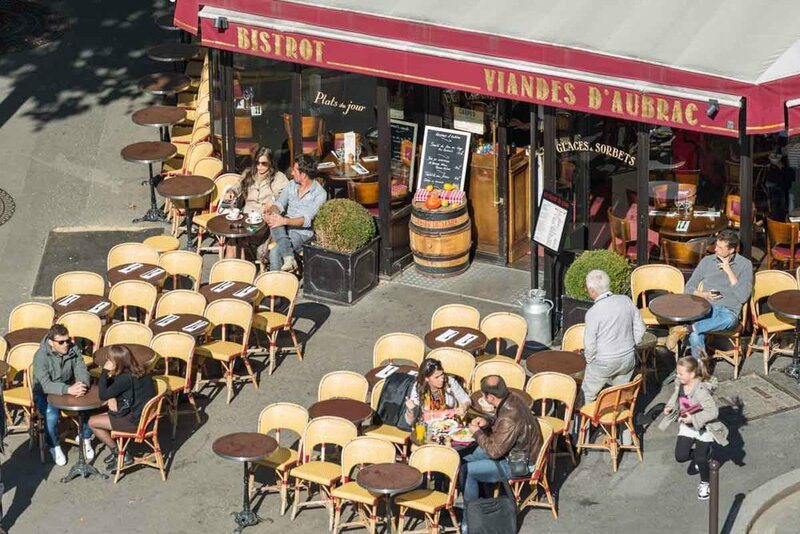 The Place du Tertre in Montmartre is surrounded by lively cafés. Strolling through the Marais one seems to pass multiple cafés on every block. They all look very inviting. The real answer is, you can stop at any of them. Prices vary, mostly by location. Some people comment that they are expensive but you can sit in a café and make your cup of coffee last for hours and no one will give you a second glance or make you feel you've overstayed your welcome. It's not just the coffee you're paying for. There was a time when visitors would grouse that the French waiters were aloof or unfriendly. You would be hard pressed today to find any waiter (or manager or owner) of any café in Paris that did not provide a warm welcome and friendly hospitality to all-comers. So visit and enjoy as many as you have time for, wherever you are in Paris. The Café Kitsumé is one of the newer and trendier cafés. Great coffee and a great place to sit and watch life go by in the Palais Royal gardens. "...I heard the laughter of her [Paris's] heart in every street café!" We love the Paris cafés – especially the classic, Parisian-style cafés. We have been photographing them for years. You will find pictures of many of them in our shop and we have just designed a large print which has 36 images of different cafés on it. We plan a Volume II and III. We even have four different sets of five postcards each, all with images of different cafés on them. Feel free to browse the new cafés section in Parisian Moments Shop.